I first reviewed this series almost 10 years ago. And have been reading them off and on for over 26 years now since they were first released starting in 1989. And to be honest I have been waiting for eBooks or an app version to come out for a number of years. There are many things I love about the eBook editions. First I can have the whole series with me all the time. 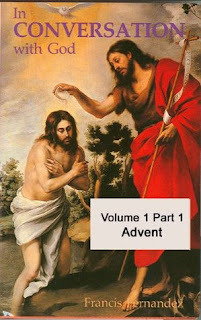 So not only can I read the daily devotion for that day and for any special feasts that day. But I can use them for study and use the extensive indexes to read specific points or search for something I read before. The biggest difference with the eBook editions is each of the 7 volumes is split in two parts. "Holy purity entails a daily self conquest, for it is not acquired once and for all. There may be times when the struggle becomes more intense, so that it is necessary to have more frequent recourse to the Blessed Virgin and to use, perhaps, some more unusual remedy." "Other ways of caring for and cultivating this virtue are those small, customary mortifications which help to keep the body under control. If we want to keep intact the most beautiful of all the virtues, which is chastity, we must realise that it is a rose that only blooms in the midst of thorns, for which reason it is only to be found, as are the other virtues, in a mortified person." "To become like children at heart while remaining adults can be costly. It requires real determination and strength of will, and a total abandonment to God. To become children we must renounce our pride and self sufficiency, recognising that we can do nothing by ourselves. We must realise that we need grace and the help of God our Father to find our way and keep to it. To be little, you have to abandon yourself as children do, believe as children believe, beg as children beg." "For each one of us, our vocation is the central theme of our lives. It is the axis around which everything else turns. Everything, or almost everything, depends on our knowing and carrying out what God asks of us." "Our Lord calls every one of us by our own name, today as much as ever. He needs us, it seems. Furthermore He calls all of us to a holy vocation, a vocation to follow him in a new life whose secret He alone possesses." "The humble person knows his place, however exalted or lowly it be. He feels he belongs there and is happy in his work. He knows his limitations and possibilities, and does not allow himself to be deceived by mere ambition. His qualifications are the right ones for his job, to a greater or lesser degree: he is never a dead weight, holding others back. He carries out his work as well as he might, as a member of a team." "The Christian way of life demands a radical change in attitude towards earthly things; they should be procured and used, not as an end in themselves, but as a means of serving God. Because they are only a means they are not worth putting our hearts into; true goods are something else altogether." I am greatly looking forward to reading this series with fresh eyes this year. And doing so through the eBook versions. These devotions all follow the same format. Each day has about 6 pages of readings broken into three sections. In the past I have read the whole thing at once in the morning, or broken it up and read part in the morning, part at lunch and part in the evening. There is so much great material in these books. I know people who have read them every year for decades now and they still get something more from them each year. It is my prayer that these book will enrich my life this year and if you give them a try that they will be of abundant spiritual blessing to you also.